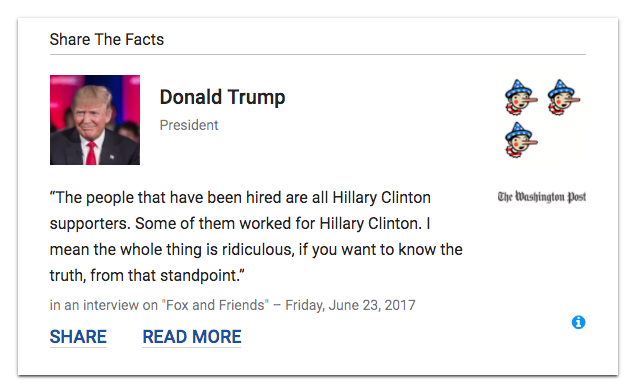 Google’s relatively new “fact-check” feature proves there’s something fundamentally wrong with at least some of its highly influential algorithms, after an investigation by The Daily Caller News Foundation found that the widget is both blatantly biased and tremendously faulty. The most powerful search engine in the world and a massive arbiter of online information, Google, has been displaying fact-checks for conservative publications in its results, while no prominent liberal site receives the same treatment. But even setting aside the exhibition of partisanship, there are other critical and profound problems with the feature. TheDC’s article makes no such claim. The quoted language doesn’t even appear in the piece. Worse yet, there was no language attempting to portray that the investigation is entirely comprised of Clinton donors. The story simply contained the nuts and bolts: Mueller hired a Hillary Clinton donor to help with the election probe. But after further inquiry, WaPo says while the fact-check did in fact occur, it never once referenced TheDC in any way, raising the question: Why was this fact-check attributed to TheDC and how did it end up on the sidebar which is the first Google-offered resource for information of the publication? A digital receipt of The Washington Post’s submission to Google’s fact-checking feature shared with TheDCNF. 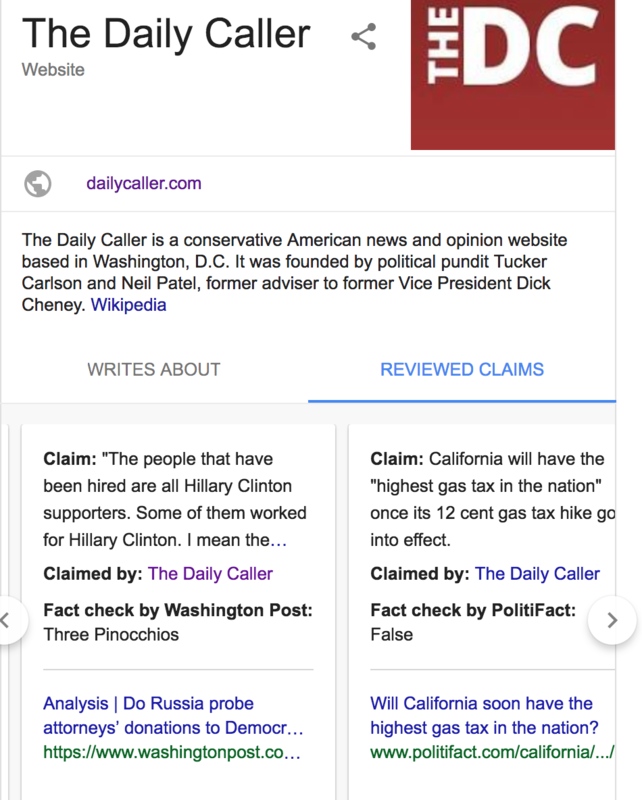 Google has since removed that single “fact-check” from The Daily Caller’s “Reviewed Claims” section, while several other erroneous ones remain and are supposedly being reassessed. WaPo’s article is still accessible on Google’s search platform, but only now is the claim ascribed to its rightful owner. Coratti said they are making their own inquiries into the matter because Google’s sloppily concocted project apparently made WaPo’s fact-checking column look unduly flawed, at least in this instance. And it did so by citing as debunked a claim never made by The Federalist and using a fact-check that never even mentioned The Federalist. Instead, the so-called ‘fact checker’ used by Google to smear The Federalist specifically addressed a separate claim made by a CNN contributor nearly three years after The Federalist’s article at issue was published. Google’s new algorithmic smear operation targeted at conservative publications is a pathetic disgrace and everyone associated with it should be ashamed. The Daily Wire, the flagship news and opinion website of conservative political commentator Ben Shapiro, was also given a “Reviewed Claims” section. Outlets and organizations spared the scrutiny along with Vox include: Slate, ThinkProgress, The Huffington Post, Daily Kos, Mother Jones, Vice and Salon — all undoubtedly on the other end of the political spectrum. Occupy Democrats was apparently the only popular blog to be subjected to the fact-check program, but that is less of a bonafide news source and more a content provider with often misleading or incorrect messaging. “This feature was introduced to help people quickly learn more about publications. Google itself does not fact check stories. Third parties do,” a top Google spokeswoman told TheDCNF. When asked what the criteria was for originally accepting fact-checkers when the program was first being assembled and established, Google was unable to answer. It did say that other organizations are able to join, and cited how the conservative Weekly Standard is one of the newest members of The International Fact-Checking Network (IFCN), a unit of the Poynter Institute. The Weekly Standard’s fact-check “went through a vetting process” in order to be a verified signatory of the IFCN, something that Google says its not a part of. Perhaps most importantly, Google’s design of its algorithms shows how imperfect and reckless such a large company could be, even as it explores or invests in highly ambitious and futuristic projects. Google refused to discuss the details behind the relevant algorithms, citing company policy.